From cool cities to the picture-perfect Alps, skiing to après-ski, urban sophistication to idyllic rural charm, Switzerland is a country that contains multitudes. The jewel in its crown is the city of Geneva, sat serenely next to the vast lake that shares its name. This is a city that’s at the crossroads of the world – one where outward-looking organisations have their headquarters - the Red Cross, World Bank, World Trade and United Nations among them. This gives the city a completely cosmopolitan vibe that permeates every street and neighbourhood. It’s also a city of contrasts, with both a serious and playful side. World-famous science projects lie close to world-class chocolate, all in a city that’s as pretty as they come. While it’s very close to the French border – there’s even a French side to Geneva’s airport – it retains a distinctly Swiss feel. It also serves as a perfect base for heading further into Switzerland or across the border for a Gallic adventure, simplicity itself with a hire car. But that’s if you want to even leave Geneva – with this guide to the very best things to see and do there, you won’t be able to tear yourself away. Wander around Geneva and you’ll be struck by its beauty. Lawns are manicured, buildings are neat and well-maintained – it could almost have been put together only yesterday. In fact, Geneva’s history is long and fascinating, and best discovered first hand as you go from sight to sight. Start on the Grand Rue, the main thoroughfare in the Old Town, an area known as the Vieille, Ville. From here you can head into the labyrinth of beautiful streets, squares and many medieval buildings. Stop for coffee on the Place de Bourg-de-Four and gaze out at a marketplace, lined with fountains, where Romans once traded. St. Pierre Cathedral is here too, a place that combines imposing looks with an interesting story to tell. It’s here that John Calvin – the founder of Calvinism – preached in the mid-16th century, while the architecture is a mixture of Neoclassical, Gothic and Romanesque. That reflects a history dating back to the 12th century, with additions since, although the archaeological site underneath has found remains of a 4th century Roman temple. Head down to explore that site, or head up into the towers for sensational views. Stroll back to Grand Rue and you’ll find the house where noted philosopher Rousseau was born in 1712, before taking in Maison Tavel, Geneva’s oldest standing house. Built in the 1100’s, it burned down but was replaced by the existing structure in 1334. It’s now a museum that lifts the lid on Geneva’s history. Gardens, cathedrals and Large Hadron Colliders – there’s plenty to keep you occupied in Geneva. Let’s start with the latter, a science site where a world-famous experiment is in action. What could have been a dry site of research is actually awe-inspiring, as the search for the Higgs Boson particle continues. You don’t need an expertise – or even an interest – in particle physics to be struck by the size and scale of what’s going at CERN, and you can wander the place yourself, or book in advance for an English language guided tour. Another recommended tour is that of the Palais des Nations, which houses the UN, and was built to house the League of Nations before it. It’s interesting inside and out, with a pleasant park where you might encounter peacocks. If you arrived in Geneva by plane, you probably spotted the Jet d’Eau from the window as you circled to land. This is one of the city’s most striking landmarks, a fountain that throw water 140m up into the air throughout the day. It’s tempting to get as close as you can to it, and on the pier that runs next to it you can feel some of the spray on your face. Switzerland is famous for its chocolate and you won’t wander far in Geneva without coming across the rich aroma of one of the city’s most luxurious exports. Indulge your sweet tooth at the countless shops, or perhaps have a go yourself. While you can tour many of the manufacturers, you can actually get hands on at Stettler and Auer. Behind the wheel of your car, the rest of Switzerland is open for you. You’ll find gorgeous, winding drives through Alpine meadows, incredible views and relatively quiet roads here – it can be a delight to drive from town to town. Heading around the northern edge of Lake Geneva, you’ll soon be in lovely Lausanne. Don’t expect it to be sedate, the nightlife here has a slightly more raucous edge than that found in Geneva, but in the day, you’ll find a handsome old town and a perfect port. Notre Dame Cathedral is a marvellous piece of 13th century Gothic architecture, while the high-tech Olympic Museum traces the history of the games in a family-friendly way. At the very opposite end of the lake is Montreux, a place best known for its long-running annual jazz festival. It also deserves to be known as a luxury lakeside resort which attracts the rich, famous and creative – Lord Byron was charmed by it. It has romantic lakeside markets, a fine old town and plentiful places to eat. Best of all, perhaps, is the waterside stroll out to Chateau de Chillon, a 13th century fortress. Approach from the water, or walk the flower-strewn promenade – when you arrive you’ll find a place immortalised by Byron, Mary Shelley, Turner and Dumas, with eerie dungeons and lavish rooms to explore. As this is a tourist town as well as place where major world organisations do business, there’s no shortage of excellent restaurants and hotels catering for the visitors. Switzerland isn’t a cheap country, but there are still good mid-range options for both food and good night’s sleep. At the top of the tree for fine dining is Domaine de Châteauvieux, west of Geneva itself. Holding two Michelin stars, it’s luxury all the way, with dishes such as Breton lobster with caviar, Bresse chicken with purple artichoke and Swiss veal. If you stay too late to head back to the city, don’t worry – there are rooms here too, classy yet cosy. In the heart of Geneva, room rates can sometimes be high, such is demand, which makes the Tiffany Hotel something of a bargain. It’s close to the old town in a cool part of town, while the hotel itself doffs its cap to the Art Nouveau in its styling. Once inside the rooms, however, it’s more sedate but with modern technology, sumptuous bathrooms and Nespresso machines in many rooms. Emerge from the stunning glass atrium to walk to Lake Geneva, only 10 minutes away. If you don’t want to go outside, there’s a more than decent restaurant on site too. Tuck into truffled macaroni cheese or veal sweetbread with Roscoff onion. It would be remiss to visit Switzerland without trying the local speciality of fondue. 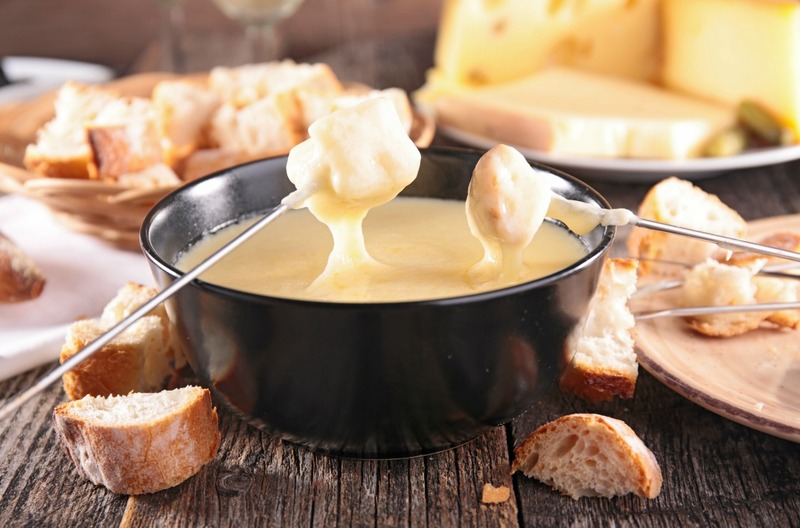 Especially good in the chill of winter, this gooey, cheesy dish is best sampled at Café du Soleil, a 400-year-old building where booking is essential. That’s testament to the great atmosphere and the quality of the cooking, and the fondue that comes in a pot lit by fire from beneath with endless bread. Dipping and dunking is very much a rite of passage in Geneva. When you’re next to a lake of timeless beauty and huge scale, it’s a given that there are phenomenal places to hike and walk, with natural wonders everywhere you wander. The mountains nearby offer ample hiking opportunities, with Mont Saleve only a few miles south of Geneva. It has marked trails and will take about four hours to climb to the top. There’s a cable car too. An hour away, La Clusaz attracts skiers in winter and walkers in summer, with challenging walks that take in peaks and lakes. If you come close to Christmas, pack snowshoes. 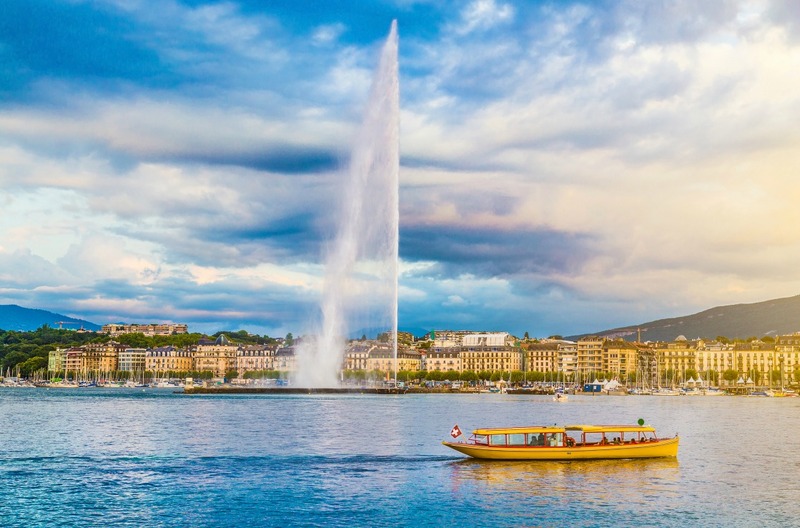 With gourmet food, history galore and that tranquil lake, Geneva is a place of riches, and perfect for a weekend trip or longer getaway. Come to ski, come to sight-see, come to walk or come to explore the majestic old town – car hire in Geneva makes it easy for you to see all that the city has to offer and discover the rest of the lake’s attractions.